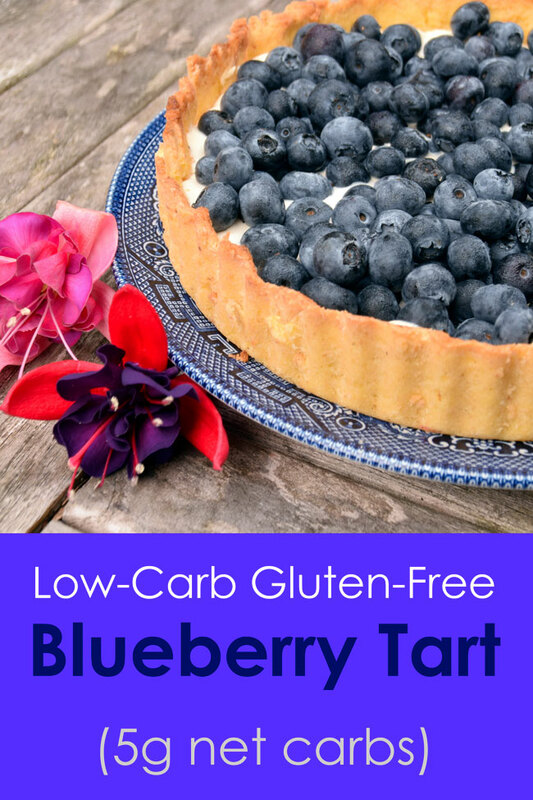 Blueberries sit on top of rich creamy mascarpone filling, inside golden almond-flour crust. 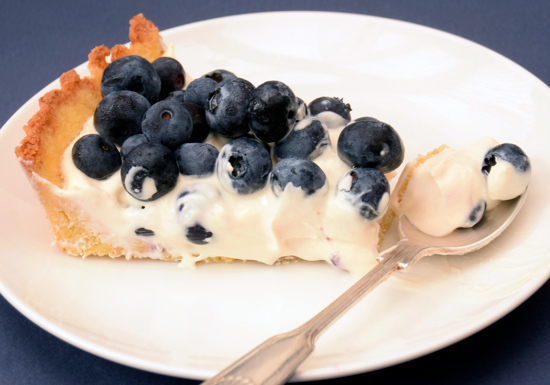 Perfect combination of tangy and sweet tastes, offset by contrasting textures: crispy crust, smooth cream and plump fresh blueberries. 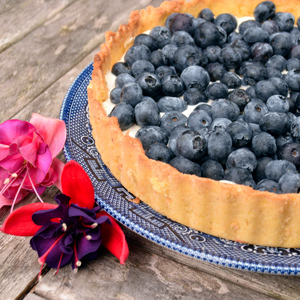 A slice of this tart will clock up about 5g net carbs. It is also a fat bomb, with 35g of fat per slice. Ideal if you are on Keto, Atkins Induction or LCHF. I stole the idea for this recipe from Jamie Oliver. Of course, I had to adapt it for low carb, and simplify it. All you need to bake for this recipe is the pastry crust. The filling only needs beating, and berries will stay fresh. Total time for prep and cooking is less than 30 minutes. This part is simple. We are going to use ground almonds, eggs and butter. Traditional shortcrust pastry doesn’t include eggs. But we do need the eggs – to compensate for the absence of gluten. Otherwise our crust might crumble away on the first touch. Luckily, this pastry does taste authentic even with eggs. It provides the solid no-nonsense base for the other, more frilly parts of the tart. I added 1 tbsp of psyllium husks to improve texture. You can use [xanthan-US] or [guar-US] instead, or 1 tsp of [arrowroot-US]. Again, this is to help with the crust’s crumbling tendencies (the bane of gluten-free baking!). While the crust is in the oven, you can make the filling. Mascarpone and whipped cream come to play together. Vanilla extract and sweetener join in to make the mix irresistible. You can vary the quantities I used – make it more sweet or more vanilla-y if you like. Be careful at this stage – once you start tasting the filling, it will be difficult to stop! Resist the temptation as the tart will be ready soon. I used blueberries, but any other tangy berries like blackberries or raspberries would work well. Adjust the carb counts if you are using different berries. How much mascarpone and whipped cream. Recipe does not list. How much xanthan gum should be used instead? Can almond flour be used instead of ground almonds?